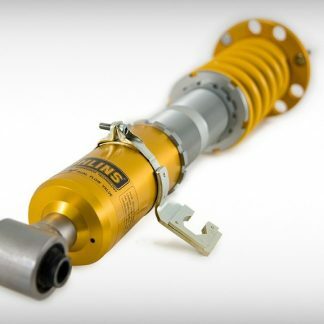 Available in anodized Black, Blue, Gold, and Red. 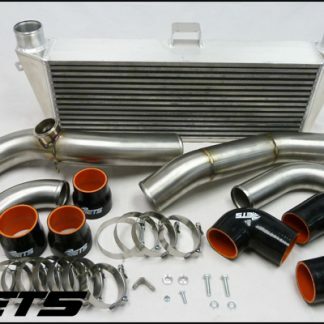 Fits Many turbo kits such as ETS, Greddy, Turbo XS, SFP, Apexi, etc. Our Standard Single and Twin Turbo kit includes 2.5″ Piping from turbo to throttlebody elbow. If you are using a Greddy Elbow on the throttlebody side you will need to use our 3″ Greddy Elbow Pipe on the driver side. We do have the option to upgrade both long engine compartment pipes to 3″ but only for cars equipped with the Greddy Elbow AND Single Turbo. The 2 Short pipes that connect to the intercooler and intercooler inlet/outlet remain 2.5″. 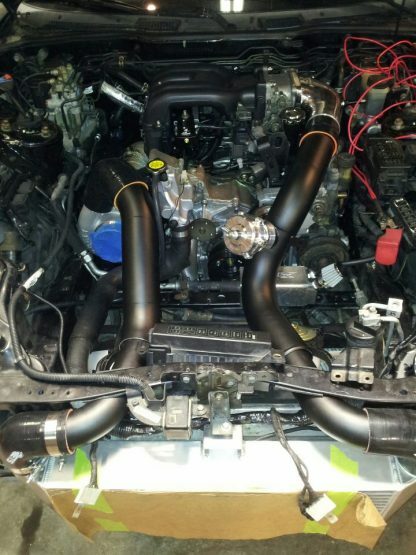 Upgrading to Single from Twin Turbos: To Upgrade to Single turbo you will need to purchase a new Single Turbo upgrade Pipe (found in piping section) and a 2.5″ 90 Degree Silicone Elbow. The performance of this unit is second to none. We developed it on our shop car (yellow FD in the pictures) which runs a T66, Haltech and all other supporting mods. When we first put the car together it had an Apexi FMIC kit on it we saw decent results but the charge air temps would creep up to 140-150 degrees. Slight detonation would occur in 3rd, 4th and 5th gears as observed on the J&S Knock sensor unit. Also because the tanks were wide and the core was small, the coolant temps were regularly over 210 degrees. All of this was with a pump gas tune at 21psi (10.5 AFR – 10 degrees ignition timing). When we switched to the kit pictured above the charge air temperatures dropped to 110 degrees and the highest we have ever seen is 122 degrees. This reduction in charge air temperature has allowed us to run 23psi regularly on pump gas with no detonation. In addition to the reduced charge air temperatures, the coolant temps dropped to 185-195 degrees and never exceed 200 degrees. All of this is with a stock bumper. 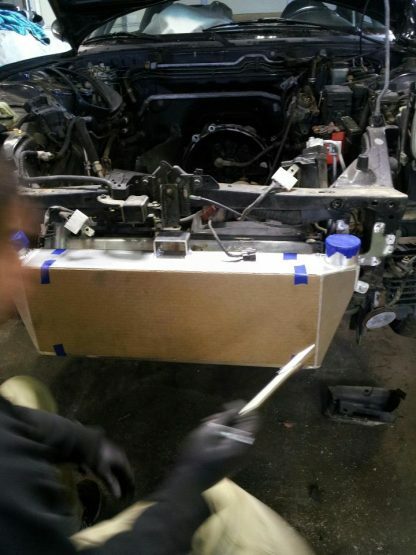 We have had a handful of customer cars with body kits that see even larger temp reuctions. Typical results for a T66 turbo at 20psi is 95-110 degree charge air temperatures and 180-185 degree coolant temperatures. 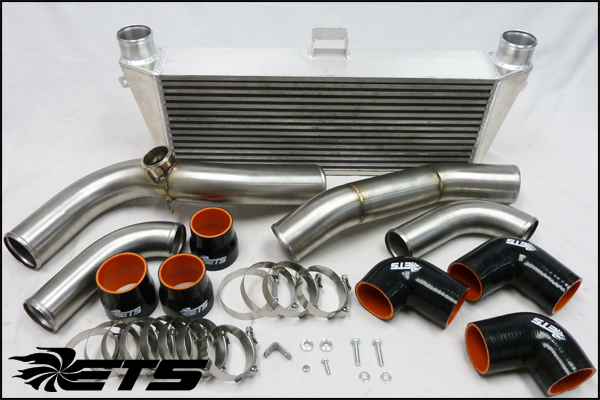 In addition to the low temperatures these kits provide, the ETS intercooler kit completely fills the stock bumper opening with core and body kits much better than any other kits we have seen with it’s ultra wide 30″ tank to tank dimension. Please contact us to customize your intercooler to your application.